A version of this blog post appeared in abridged form on Polaris and in the Hamilton College Spectator on February 13, 2004. Strunk died in 1946. In early 1957, H.A. Stevenson, editor of the Cornell Alumni News, filched from the campus library one of its two remaining copies of The Elements and mailed it to a longtime friend, E.B. White. Seeing the book again inspired White to write an affectionate piece about his late professor for the New Yorker. An editor at the Macmillan Company, J.G. Case, spotted the article and asked White if he’d like to revive the book. Thus was born The Elements of Style, with Revisions, an Introduction, and a New Chapter on Writing by E.B. White (1959). In 1972, White published a second revision with the help of Eleanor Gould Packard. 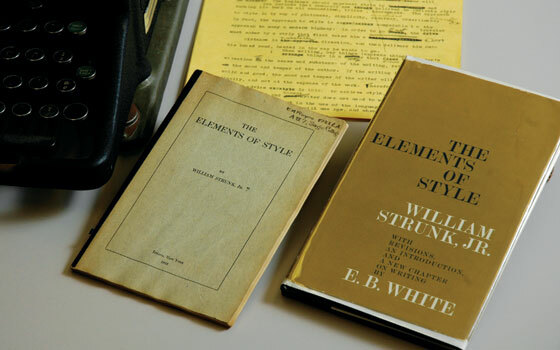 A longtime copy editor and authority on grammar and style at the New Yorker, Miss Gould had bought a copy of The Elements when it first appeared, marked it up as she would mark a raw proof, and slid it into a drawer of her desk. White knew nothing about this—Miss Gould was too shy to admit doing it—but later, when The Elements was up for revision, White asked for her help. She agreed, and revealed that she had in her possession a marked-up first edition. In 1979 White published a third edition, which included an index prepared by Lieutenant Colonel Laurence W. Mazzeno of the United States Naval Academy.